There seems to be a common perception that the 1X magnification setting of a magnified optic is pretty much the same as a red dot sight. The thought is that you can get a 1-4X, 1-6X, or 1-8X and have red dot sight-like performance on the low end and have some magnification for when you need to stretch things out a bit. That may be true (or at least close enough) in terms of speed as long as you are standing upright but red dot sights are about more than speed and you may have to shoot from a position other than upright. Today’s low-power, variable magnification optics are quite good but they still do not fully replicate some of the most useful attributes of a red dot sight as it pertains to the self-defense minded shooter. 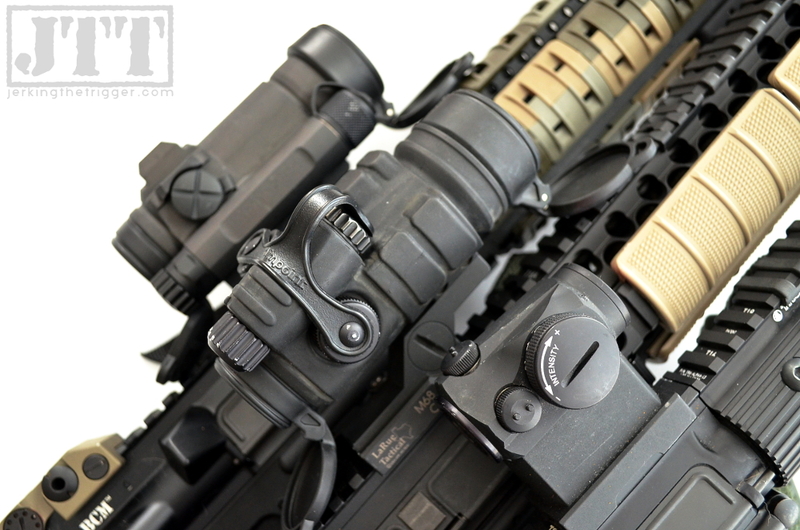 It is up to you to decide which optic better fits your needs. Red dot sights (RDS) allow a properly trained user to accurately engage targets very quickly, especially at shorter distances. This is because they lack magnification and the shooter can essentially look through and past the RDS at their target with normal, uninterrupted binocular vision. It is more akin to looking through a window than through a telescope. You simply bring the RDS to your line of sight and squeeze the trigger when the dot is on the target. The best 1-4X, 1-6X, and 1-8X optics offer 1X magnification that is close enough to approximate the same technique. Your field of view may be slightly limited but your mind does a fine job of stitching the images from your left and right eye together. 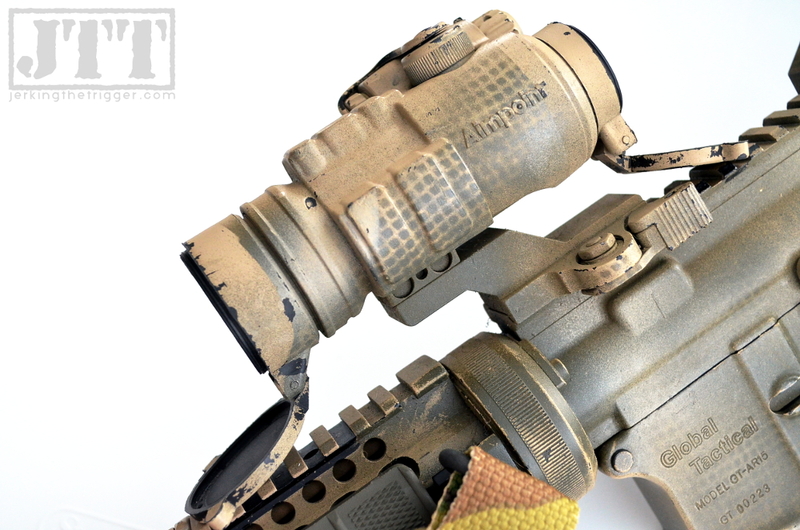 This allows the shooter to achieve RDS-like speed at 1X magnification. However, as I stated above – red dot sights are about more than just speed. Few people think about eye relief other than making sure they have enough that they don’t get a black eye from their optic during recoil but eye relief takes on different importance when talking about self-defense shooting. You must have enough eye relief to allow awkward and improvised shooting positions that may happen when you find yourself shooting anywhere other than the range. Eye relief is the distance from the objective end of the optic at which you can place your eye in order to see clearly through the optic. Magnified optics have a set distance at which the view through the optic is optimal. Some of the more forgiving magnified optics have a range in which the field of view acceptable but if you stray outside of that range, the optic may be unusable. Red dot sights typically have unlimited eye relief. If you can see the dot, you can get the hit no matter how close or how far your eye is from the RDS. Now, imagine yourself shooting from a supine position, roll-over prone, plain old regular prone but you are wearing armor. I know from experience that this is doable with a magnified optic but I also know that it is far easier with an RDS. This discussion of eye box will be along the same lines as the eye relief discussion but it is a slightly different issue. Eye relief is about the parallel, linear distance between your eye and the optic. Eye box is more about the 3 dimensional, cone shaped space behind that optic that your eye can occupy and still have an acceptable view through the optic. If your eye is not well centered behind a magnified optic, you will see that your view through the optic begins to darken and become occluded. This effect worsens as your eye moves further and further from the center of the optic. Optics that have larger eye boxes are more forgiving of less than perfect positioning or technique. Even the most forgiving magnified optics that I have used can’t approach the eye box of a good RDS because there is no eye box with an RDS. Again, if you can see the red dot, you can get the hit even if your cheek weld is less than ideal. Like eye relief, eye box also has bearing on an optic’s usability from awkward or improvised shooting positions. Time spent hunting for your sight picture in an awkward position, is time that likely would have been better spent shooting. Modern, high quality, magnified optics handle low light fairly well. High quality glass and modern coatings can go a long way toward getting the light information that you need in a low light situation into your eye. In spite of the technology that goes into making sure your magnified optic transfers as much of the available light as possible, it still doesn’t approach the light transmission of a quality RDS. There are just fewer light robbing surfaces in an RDS. In essence, the light doesn’t have to pass through as many lenses. RDS are excellent low light performers. They have an edge over most, if not all magnified optics in this regard. You cannot co-witness your iron sights through a magnified optics. A properly mounted RDS will allow you to either use your sights through it in the event that it fails or even be used as a large rear aperture on its own. I think weight is always a factor worth considering and it is pretty simple in this case. An RDS will usually weigh less than a magnified optic. They will often weigh a LOT less. Magnification comes in handy as you start to stretch the distance at which you are shooting. However, I suspect that for most of you who are reading this, you are more likely to have employ your carbine under duress across the length of your living room than across the length of a bean field. If that is true of you, it may be that an RDS suits you more than a magnified optic. Can you mitigate some of the above with training? You could probably mitigate the eye relief and eye box issues. You could train from awkward defensive shooting positions so that you are used to what it takes to get your eye in the optimal position behind a magnified optic. I just think it might be wiser to consider choosing an optic that better fits the reality of how you might have to use your firearm. The choice is up to you and it can be especially difficult since you aren’t necessarily wrong no matter what optic you choose. Just know that 1X on a magnified optic is not like an RDS as some people may lead you to believe. It just isn’t. Magnified optics are great but sometimes you just need a red dot sight. Note: I didn’t bring up field of view because as long as your lowest magnification setting is fairly close to true 1X, your brain does a good job of merging the view through the optic with the view from your unaided eye. This shouldn’t really be much of an issue with a good 1-4,6, or 8X optic.